The Blue Damsel Lodge is located on the banks of Rock Creek, Montana which is a designated blue ribbon trout stream that supports an incredible host of aquatic insects providing for some great hatches. 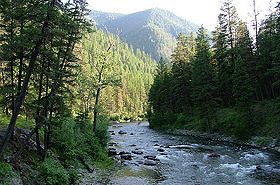 Rock Creek also boasts and one of the highest trout counts in Montana. Rock Creek fly fishing trips offer you some truly great hatches and some of the best trout fishing water in the state of Montana. Rock Creek is nestled in the Sapphire Mountains and most of the stream’s 50 plus miles flow through the Lolo National Forest. These forested mountains, coupled with the cliffs and sheltered valley make for what has been written about as one of the most beautiful valleys in the state. Most locals and repeat guests agree with our outfitter-Rock Creek unquestionably provides the best opportunity to catch a western Montana grand slam while fly fishing. Good numbers of rainbow trout, brown trout, westslope cutthroat trout, and even brook trout inhabit Rock Creek, along with the protected native bull trout. Incredible stonefly hatches, especially the salmonfly hatch, comes to mind when you mention fly fishing Rock Creek. Good caddis and mayfly hatches, and lots of great hopper action in the summer make for good dry fly fishing thoughout the season. Virtually every aquatic insect in western Montana lives in abundance in Rock Creek, so nymphing is always a very productive fly fishing method. Rock Creek is open to fishing from boats/rafts only until June 30, which makes our “home stream” a perfect wade fishing stream. There are lots of long riffles, heavy pocket water, side channels, tributary confluences, a good number of small pools, and plenty of woody structure all made for fly fishing. There is a lot of grade in its short 50 mile course, which makes reading water very important, but equally easy. Basically, if something looks like it should hold trout, it does! A lot of trout in the 10”-16” range are caught fly fishing, with some browns going over 20” and the occasional 18” rainbow coming to hand.